The bass part for Strauss' Till Eulenspiegel's Merry Pranks, Op. 28 has been edited by Paul Ellison, in-demand double bassist, professor, presenter, and former Houston Symphony Orchestra principal bassist of 23 years. Ellison's bowings, fingerings and other editorial markings have been added throughout the score. Till Eulenspiegel's Merry Pranks is a tone poem by Richard Strauss which chronicles the misadventures and pranks of the titular German peasant folk hero. Till Eulenspiegel is represented by two themes. The first, played by the horn, is a lilting melody that reaches a peak, falls downward, and ends in three long, loud notes, each progressively lower. The second, for D clarinet, is crafty and wheedling, suggesting a trickster doing what he does best. The work is scored for a large orchestra. 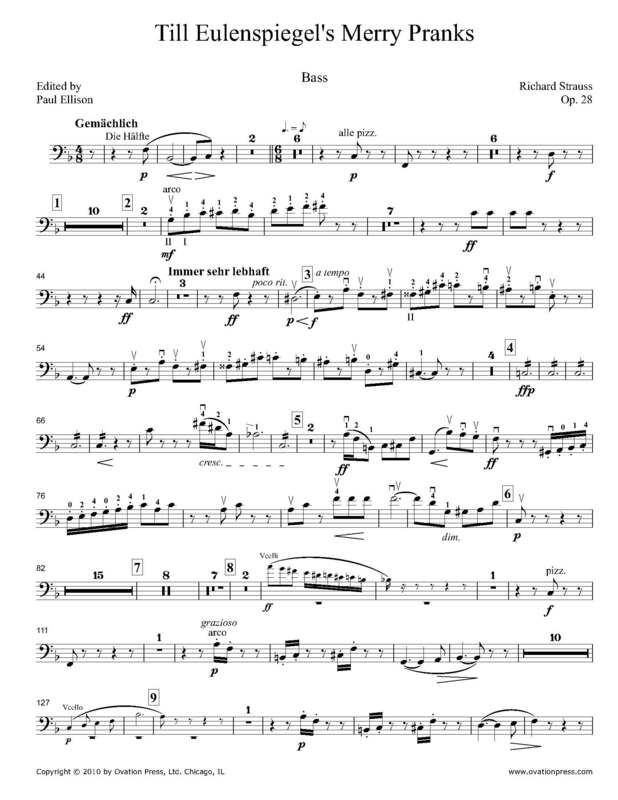 Download and print the score today to gain access to expertly edited Strauss Till Eulenspiegel's Merry Pranks bass fingerings and bowings from Paul Ellison!